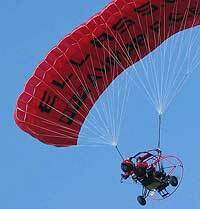 FAI World records are of course the definitive and internationally recognized way the ultimate performance in microlights and paramotors is recognized. There have however been some other performances in which either it was not possible to claim a World or National Record (for example, there are no "City to City" or "Round the World" records), or for some reason a record was not claimed, or the flight was one of the first over an 'iconic' route like the English Channel, Coast to Coast USA, the Atlantic ocean, London-Sydney or round-the-World, or there was simply something about a flight which was remarkable at the time it was done. It is perhaps salient to remember that before about 1995 nearly all the flights were done without the benefit of gadgets like GPS, satellite phones and emergency beacons which are often all considered essential today. If you know of a feat which merits inclusion on this page or you can add detail to one already here, please contact RMH. Flew a Pegasus Quantum solo and unsupported from the east coast of the USA to the west coast, and then back to the east coast, overflying the ocean in each case. Started near South Beach Miami, visited SunNFun, and then across the southern states, overflying many famous landmarks, eventually reaching the Pacific Ocean at Ventura California on April 26th. Then went north to San Francisco and headed back east via the northern states, clearing the Rockies around Yellowstone, visiting Oshkosh and overflying more famous landmarks, arriving at the Atlantic Ocean just south of New York. A final flight took place on May 8th when he flew the New York Hudson River VFR low level corridor, north and then south. 23 flying days, 6 with only a single flight of under 1 hr 30 mins due weather. Total distance 7210 miles, 7283 miles including Hudson flight. They took off at 14:07 CET from Cruden Bay, Scotland for a 250 Nm flight across the North Sea to Reve, near Stavanger, Norway exactly 100 years to the day that Norwegian Tryggve Grans made the first flight across the North Sea in a Bleriot monoplane. It was at the time by far the longest overwater flight yet performed. 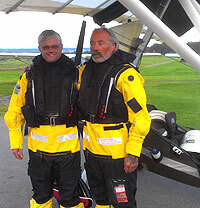 Per and Hakon dressed similar to professional North Sea helicopter pilots in the best survival gear and safety equipment the industry can offer. Their flight was a monumental organizational undertaking but they were able to depart exactly at the planned time, and with favorable tailwinds made the trip across in only 2:50 hrs. It was a great success for them personally, for the local microlight community and for the Norwegian Airsports Association. 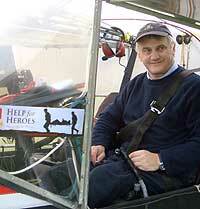 On arrival they were received by several hundred microlight friends, neighbours, media and notabilities. Landed on the deck of MV Oceanic, a 3,500 dwt special purpose ship with a unique 90m x 15m flat deck (60m usable), in the English Channel, and then took off again. Jaap says: "the 'just in case something goes wrong' flat area for emergency landings just looks too good, so I cannot restrain myself and get away with landing on the moving ship. Tom and Aalbert save the day by courageously helping me to take off, as the deck was slippery with salt spray. 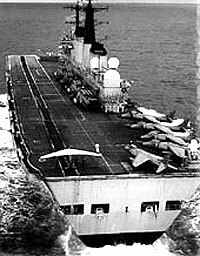 What is misleading is that control is perfect at several metres above the deck but as soon as you get a metre or two above the deck to land 1) there is curlover turbulence coming off the bow and sides 2) you have only some visual reference like the mast in front (which appears very close indeed); the deck under you is not visible as it is too narrow. I won't do it again unless an aircraft carrier would invite me (please do !!). But it worked - thanks to an amazing aircraft, the STOL Aeroprakt Foxbat A22. The ship was sailing at 9 knots speed over ground, the true windspeed was 14 knots, combined just under the full flap stall speed with just myself in the plane and full long range fueltanks. 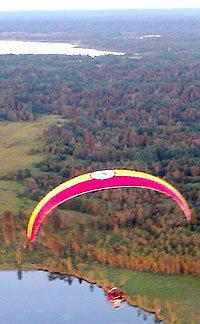 Unsupported paramotor flight the length of the Volga river; 3300 Km in 18 days. The idea was every landing place should be takeoff place and not to move any other way except by air. The maximum transportation by foot was 100-200 m.
Yesterday we start our very nice and interesting project. We took off at begining of Great river Volga. It is only half meter there.... No records, no competition, no race! We just fly from place to another and enjoy the wonderful views. We do not use any support team's help and move only by air. We have to minimize our baggage and took only what we can carry... Finally after 18 days and 3300 km of flying we arrived to our destination Astrakhan. The place where Volga River became the Caspian sea. Matevz's second circumnavigation (see 2004 below), via more than 50 countries. Considerable distances over the Atlantic, Pacific and Indian oceans, visited Antarctica, Easter Island (the World's most remote island), flew over Aconcagua and Everest, and in keeping with the 'green' nature of the flight, more than 120 National Parks. Total distance of 91,003 km (33,100 km over water) in 369 hours at average cruise speed of 268 Km/h at flight level FL100. The highest altitude achieved was 8965 m / 29,413 feet in the vicinity of Everest (overhead Nuptse, Lotse, South col) and the highest ground speed recorded was 352 km/h. The entire flight consumed 6679 litres of fuel. Dave has been confined to a wheelchair since a motorcycle accident in 1993. With considerable experience from previous solo journeys across Europe there was no plan to have any 'carer' or someone else following along to help him. He set off on this flight from Rufforth airfield and flew via France, Italy, Malta, Greece, Cyprus, Egypt, Saudi Arabia, Qatar (a particularly difficult day in a sandstorm between Riyadh and Doha), UAE, Oman, Pakistan, India, Bangladesh, Monsoons in Burma, Thailand, Malaysia, Indonesia to Australia, finally arriving in Sydney after 23,000km and 277hrs of flying. This trip was flown to raise money for the charity Yorkshire Air Ambulance. Aircraft: PAP 1400 / H&E R220 Duo / Advance Sigma 7. Aircraft: Fresh Breeze Flyke / Silex. Aircraft: Rans S6 / Rotax 912. 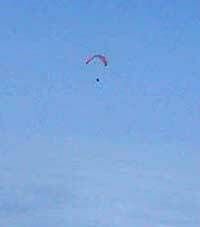 Aircraft: 2 x Back Bone / Ozone Viper Paramotors. 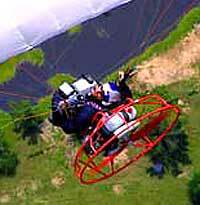 Aircraft: PAP 1400 F200 / Ozone Magnum tandem Paramotor. 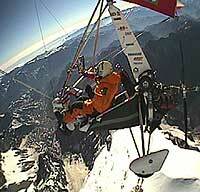 Flew over the summit of Mt Blanc 4810 m (15781 ft) in a tandem paramotor with a takeoff weight of 228 Kg. 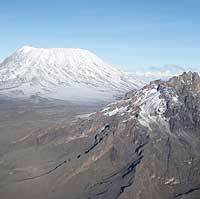 to an altitude of 5009m (16433 ft) Ozone news. 22 July - 12 August 2008, Belgium - Istanbul unsupported. Aircraft: 2 x H&E R120 / Gradient Aspen 2 with trims. July - August 2008, The length of British Colombia. 1700 Km flight from from Prince Rupert to Nelson examining de-forestation in British Columbia and spreading alpine flower seeds in clearcut areas from the air. Our motto is: our forests, our responsibility. That means not just being a victim to the pine beetle or the logging companies and their ill practices. Instead, it's about obtaining an understanding of what's going on and seeing what you can do. Although one of these flights won two World records, there were in fact four tandem flights over the highest mountain in Africa 5895m (19340 ft) from Moshi, Tanzania. Each flight took about one hour. Aircraft: Flight Design CT sw / Rotax 912S. Being registered as an Indian Air Force aircraft considerably smoothed the diplomatic path for this 40497 km (21866 Nm) flight in 80 days flying from Indian Air Force Station Hindon, via Burma, Thailand, Vietnam, China, Russia, USA, Canada, Greenland, Iceland, UK, Germany, Italy, Greece, Turkey, Iran and Pakistan back to Hindon at an average speed of 21.092 km/h. On their return, Chief of the Air Staff Air Chief Marshal F.H. Major AVSM PVSM SC VM ADC said "These two have shown what trans-oceanic reach really is. We are thankful to the governments of all the nations who supported us. They have built goodwill for the IAF." Expedition web site. 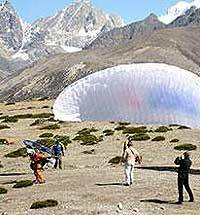 No evidence has ever been produced to substantiate the initial claim to have actually flown over Mt Everest in a Paramotor, or the later claim to have flown higher than 8848m (29035 ft), but nevertheless it was a remarkable achievement to even take off with such heavy equipment at 4200m (14000 ft) near Pheriche in Nepal. The sole existing GPS record of the flight suggests they reached about 7600m (25000 ft) which exceeded the existing World Record. 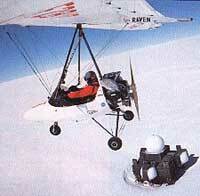 GKN Mission Everest and Parajet. 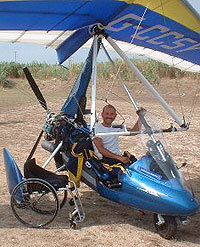 Aircraft: PAP Ros 100 / Advance Omega 7 Paramotor. Aircraft: Pegasus Quik GT450 / Rotax 912S. 12 hours before departure, the original pilot who was to accompany blind co-pilot Miles Hilton-Barber to Australia dropped out of the expedition. A rescue plan was put together and within three days Brian departed Biggin Hill with Miles for France, Italy and Greece. Richard took over six days later in Rhodes to complete the 18264 Km (9862 Nm) flight to Sydney in 184 hours flying time over 55 days via Cyprus, Lebanon, Syria, Saudi Arabia, Bahrain, Dubai, Oman, Pakistan, India, Bangladesh, Burma, Thailand, Malaysia, Singapore and Indonesia. 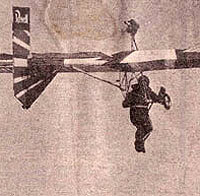 The flight attracted considerable press attention for the charity Seeing is Believing but the secondary ambition that Miles should do most of the flying was less succesful because the gagetry he relied on to 'see' for him was not sufficiently developed to be of much use. flymicro.com, mileshilton-barber.com and Brian Milton's A jolly little caper. 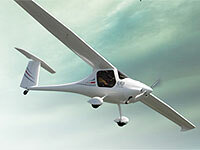 Aircraft: Pegasus Quantum XL / Rotax 914 towing an Atos semi-rigid hang-glider. Takeoff at 3000m (10,000 ft) from the main road between Argentina and Chile to fly over the highest mountain in the World outside the Himalayas 6962m (22841 ft). 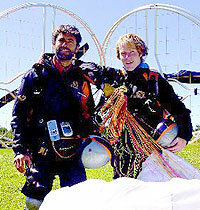 They reached 7244m (23768 ft) above the summit where Angelo released the tow. The whole flight took 1 hr 11 min. Aircraft: 2 x Bailey 4 stroke. Totally unsupported 'bivouac' flight of three days by foot-launched paramotor to the World famous Coupe Icare event. They flew from Brighton to Newhaven port, got on the ferry to Dieppe and then flew 600 Km (323 Nm) from Dieppe harbour across France landing near petrol stations Etc. as necessary. 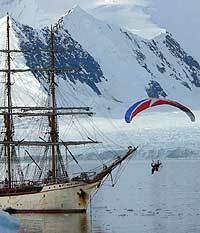 Sailed to Antarctica from Ushuaia, Argentina in the 47ft yacht Gambo. 23 flights totalling some 15 hours duration on and around Wienke Island followed by the aerial filming of the climb of two mountaineers to the summit of Mount Noble, 1000m (3500 ft) late into the night of 6 & 7 February. Incidents included being caught out by a downdraft off an ice cliff and crashing into the sea before being rescued after 10 minutes in freezing water. Full story and Nice photos. Aircraft: Pipistrel Sinus / Rotax 912. Having crossed all of Asia and America his first attempt at this flight in 2002 fell foul of the Canadian authorities who (like Brian Milton qv) refused to let him continue over the Atlantic in his Zenair CH-701 "The Blue Lightning". 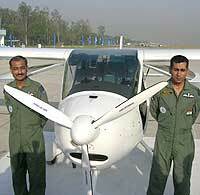 This second attempt was in an aircraft with a 2700 Km (1400 Nm) range and equipped with a three-axis auto-pilot. He flew 36692 Km (21000 Nm) in 80 days at an average (flying) speed of 180 Km/h (97 Kt) from Slovenia, over Hungary, Ukraine, Kazakhstan, Mongolia, Russia, Alaska, USA, Canada, Greenland, Great Britain, France, Spain and Italy back to Slovenia. He wrote about the flight in Around the only World. wingsforever.com. Article in Pacific Flyer magazine. The team waited for three weeks for the extremely changable local weather conditions and the extreme upper winds to be suitable for an attempt. Takeoff at Syangboche, Nepal towing a glider was not easy at 3700 m (12200 ft), but in almost perfect conditions they climbed to over 8500m (28000 ft) when the tow line broke somewhere above the Lhotse wall. Without the tow, Richard rose rapidly and within a few minutes, at 8.15 am was able to look down and wave to a group of climbers standing on the Summit at 8848m (29035 ft). Maximum altitude was 9129m (29954 ft) and the 60 Km round trip took just over two hours. Aircraft: Sky Arrow / Rotax 912 and Avid HH / Rotax 912. Return flight from Fielding to these remote Pacific islands some 763 Km (412 Nm) east across the International date line in mediocre weather. Havill wrote about the flights in part 1 and part 2. His final comment: "I wouldn't have missed the experience for anything; what a blast!!!" Aircraft: CFM Shadow / Rotax 447. Gertie, the aircraft she flew from London to Sydney 17 years earlier was spruced up with a new paint job in a fetching shade of pink and they set off to emigrate together to East Africa to help with wildlife conservation. Route via France, Italy, Greece, Egypt, to Sudan where she had an engine failure in the middle of nowhere and an enforced sojurn with SPLA rebels until they were pursuaded to build her an airstrip to continue the flight on to Kenya and the final destination in Tanzania. She wrote about the flight in Gertie's day out. A landing box 20m long and the width of the runway was set up at Kemble airfield. A successful landing was judged to have been achieved if both main wheels were on the ground, simultaneously, at some point inside the landing box. Only one successful landing was allowed per approach and each approach had to be the culmination of a full 360ï¿½ circuit. Of 105 approaches, 102 successful landings were observed by three adjudicators within the one hour period and Steve received recognition of this by Guinness World Records. In an attempt to recreate the 3000 Km (1600 Nm) flight in 1919 of Alcock and Brown in their Vickers Vimy, Brian set off from New York equipped with a giant 438 litre fuel tank to Newfoundland but ran into extreme difficulties when the Canadian authorities refused him permission to continue out over the Atlantic. Undaunted, he retreated to a small airfield at Grand Falls, filled it with over 300Kg of fuel and set about waiting for the weather which had been unusually bad over the ocean all season. Within two days the forecast looked promising, he tore down the runway for the 35 hour flight to Ireland but the heavily laden machine failed to climb higher than 50 ft in severe rotor and he decided to land before the end of the runway, whereupon the undercarriage collapsed and the propellor shredded. The full story was published in his book Chasing Ghosts, An attempt at the Atlantic by Microlight. Ventura, California to Kittyhawk, North Carolina. A film was made of the journey: Paragliding across America. 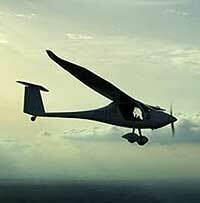 Aircraft: Pegasus Quantum Q2 / Rotax 912 towing an Atos semi-rigid hang-glider. Starting in Tozeur, Tunisia, the plan was to aerotow Angelo to reasonable heights in daily stages whereupon he would release and glide in an attempt to follow the central mediterranean bird migration route. For the sea crossing, Angelo would be towed to 6000m (20000 ft) over the coast so he could glide the 150 Km (80 Nm) to Sicily. In the event, the tow was never released before the day's destination was in sight and the mediterranean crossing was done at 4000m (14000 ft). Total distance to Catania Sicily, about 900 Km (485 Nm) in 7 legs. 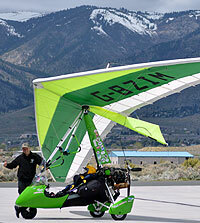 Aircraft: trike / Rotax 914. 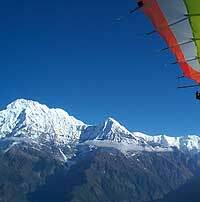 Equipped on this second visit to Nepal with a Rotax 914, Jan still had some engine troubles but climbed over Annapurna I 8091 m (26545 ft) in 45 minutes thus becoming the first to fly a microlight over an 8000m mountain. He eventually reached 8400m in 90 km/h winds and -35°c. After a much longer return leg, he landed safely back at Pokhara airport. 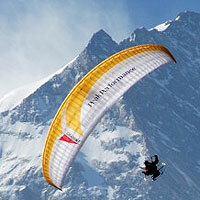 Annapurna High 2000, Czech Ultralight Expedition. 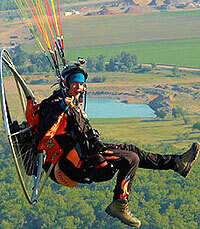 Aircraft: Vortex / Reflex wing Paramotor. 1199 Km (647 Nm) in 18 legs over seven days during the 'fuel crisis' which made it difficult for his support team of Royal Marines to keep up. The full story is on the Firstnet Challenge 2000 website. 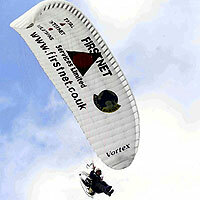 Aircraft: 3 x Flylight Doodlebug / Radne Raket, 1 x Solo 210 Paramotor / Fresh Breeze Silex. 450 Km (242 Nm) flight from Radwell to near Paris in several stages. 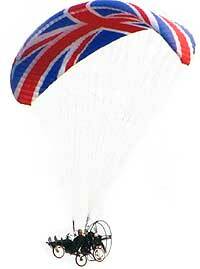 First crossing of the channel by a Briton in either a Paramotor or a Powered hang-glider. Richard's engine siezed 1 mile short of Calais airport but it was a dry landing, the others continued on to Paris. Formed the NOW Challenge with British helicopter pilot Jennifer Murray to race microlight vs helicopter around the globe in support of the charity Operation Smile. The flight was sponsored by NOW (Network of the World) and Tommy Hilfiger. A broken exhaust over Jordan required emergency mid-air repairs, and in China he was forced to land by fighter jets firing flares after diverting 100 miles off the authorised track to avoid a storm; Jennifer Murray was quoted as saying "It's caused a bit of a diplomatic incident." As with Brian Milton's (qv) flight, they had difficulties obtaining permissions to cross Siberia and he had an engine failure in USA. The team was blessed with relatively calm weather on the final major leg of the journey over Greenland and Iceland. The 39922 km (21556 Nm) circumnavigation in 600 hours over 99 days was completed at an average speed of 16.53 km/h, the longest over-water flight was 1089 km (588 Nm) in 12 hours. Jennifer Murray wrote about the journey in Now Solo: One Woman's Record-Breaking Flight Around the World. 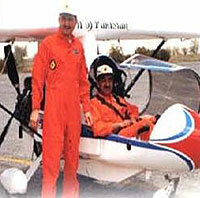 Aircraft: Aerotrike Cobra 912S and DTA Voyageur 912S. 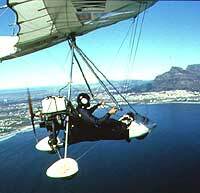 The South to South expedition, also known as the Millennium Microlight Adventure, this flight was dubbed the 'last great flying adventure of the 20th century.' Originally intended to be a flight around the Pacific from South America to South Africa; they started in Buenos Aires, Argentina and headed south to Patagonia before crossing the Andes to Chile. Having already flown over Peru, Ecuador, Colombia, Panama, Costa Rica, Nicaragua, Honduras, El Salvador, Guatamala and Mexico they learnt in USA that the Japanese would not give them overflight permission. Undaunted, they turned right rather than left and continued over the North Atlantic via Canada, Greenland and Iceland to the UK. Then south across Europe via Belgium, France, Spain, Portugal and the west coast of Africa through Morocco, Mauritania, Mali, Burkina Faso, Benin, Nigeria, Cameroon, Gabon, Congo, Angola and Namibia to finish in Capetown, South Africa. The total distance was 43000 km (23218 Nm) which was covered in 450 hours of flying. The longest single sea crossing was 840 Km (453 Nm) from Iceland directly to Scotland. Over the Great Americas. In a powered parachute with a takeoff weight of 208 Kg carrying 90 litres of fuel, flew across the Mediterranean 786 km (424 Nm) from Frejus to Bizerte, Tunisia in 10h 56m. While he had done the same kind of landing with a flexwing in 1994 on a moving truck, he said of this achievement at Dunkeswell Airfield, Devon "I think we'll make the platform a little longer next time". Aircraft: Pegasus Quantum / Rotax 912. In a bid to circumnavigate the globe in 80 days, with co-Pilot Keith Reynolds they set a blistering pace across Europe and Asia in GT-Global flier, but ran into trouble with permissions to cross Siberia. At this point Keith left the expedition and Brian completed the flight solo from Alaska, across USA, Canada and the North Atlantic back to UK. 37039 Km (20000 Nm) in 120 days total time, Brian's book Global Flier, around the World in 80 flying days has the full story of this epic flight. 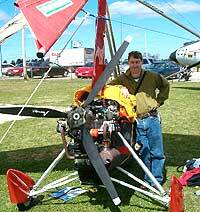 Aircraft: Mainair Blade / Rotax 912. Reported to have said before departing: "I'm hoping to set a fast time to keep the record for a few years. Hopefully when I'm in my rocking chair I'll be able to sit there and say I've still got the record." He lived up to the promise by setting the fastest time yet, by flying 'The Spirit of Diana' 21880 Km (11814 Nm) to Sydney via France, Italy, Greece, Egypt, the United Arab Emirates, Pakistan, India, Bangladesh, Burma, Thailand, Malaysia and Indonesia in 49 days, beating the record set by Brian Milton (qv) by 9 days. Had a difficult time in a weather front over the Timor sea between Indonesia and Australia. He left Fielding, New Zealand on July 24 for the flight to Coffs Harbour, Australia via Kaitaia, Norfolk Island and Lord Howe Island. He then repeated the flight in reverse departing on August 4. When asked why he risked his life crossing the Tasman in a microlight, the pensioner-adventurer replied "I want to die with memories rather than dreams". Aircraft: 3 x Pegasus Quantum 15 Sports. Flight of approximately 10,000 miles, uunaided by ground support. Dubbed the "tailwind tour" as almost every flight was tailwind assisted. They were jointly awarded the BMAA's "Steve Hunt Trophy" for outstanding airmanship. 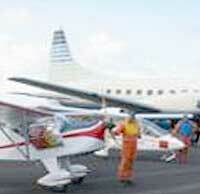 The flight was in support of "Flight-Aid" a charity combating Leprosy in Africa. Keith Ingham, when asked: Why? Answered: "I've never heard of anyone on their death-bed who said I wish I'd spent more time in the office". Aircraft: 2 x Pegasus Quantum / Rotax 582. 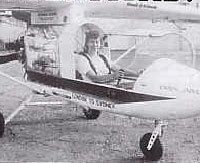 The first flexwing crossing of Canada; team Leader Allistair Wilson flew one of the machines while a relay of pilots flew the other 6400 Km (3475 Nm) in 82 hours of flying spread over 27 flyable days. Due to bad weather conditions the journey took 52 days in total. Starting from Eshott, the group had only got to Headcorn when they realised that one of them had forgotten his passport. A frantic telephone call resulted in a faxed copy being sent down, and this was accepted (though not always easily) throughout the journey. 42 hours flying covered 1600 Km (868 Nm) with 27 take-offs and landings. The Great Adventure; a race of about 1850 Km (1000 Nm) from Villanueva del Pardillo to Radwell saw just four minutes between the three fastest times. John Fack and Co-Pilot Andy Griffin just won outright by one minute from Graham Slater and Ron Newham in the astounding time of one day, two hours and thirty three minutes. Third place was taken by Tony Baker and Nick Drinkwater. 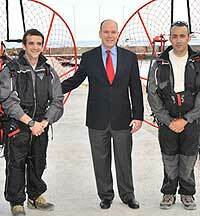 All three flew their Pegasus Quantums from Madrid to Abbeville in Northern France in one day. The winning average speed was a remarkable 56 Km/h including the overnight stop. The long-standing legacy of this event was that flying to Europe became much less of a mystery to many ordinary British microlight pilots. 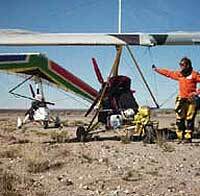 The Cape to Cape expedition covered 21000 Km (11339 Nm) in 245 hours over 52 flying days from Capetown, South Africa to North Cape, Norway, via Namibia, Zimbabwe, Zambia, Tanzania, Kenya, Ethiopia, Eritrea, Sudan, Egypt, Greece, Italy, France, Germany, Denmark and Sweden. 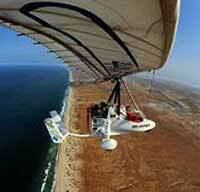 First ever unsupported flight up the length of Africa, generally against the prevailing wind. They encountered sand storms in Sudan and took 9 hours to cross the Mediterranean from Alexandria to Crete. Aircraft: 2 x Pegasus Q. Aircraft: Mainair Flash 2 Alpha and a Pegasus AX3. First flight across the North Sea from Sumburgh, Shetland Isles to Haugesund, Norway took 5hrs 5mins, then home via Denmark, Germany, Holland, England, Wales and Ireland. The flight raised money for Amnesty International and they were awarded the BMAA's "Steve Hunt Trophy" for outstanding airmanship. Brian Milton led 22 pilots each with a journalist passenger on a flight from Heathrow to Le Bourget to celebrate the 75th anniversary of the first commercial international passenger flight over the same route. The group were waved off by a crowd of CAA grandees in very marginal weather conditions. Some aircraft made emergency landings not long after in a wet and foggy field somewhere the north side of the Surrey Downs and one of the passengers, a red-top features writer, got out of the machine the moment it had stopped and ran away, never to be seen again. 16 aircraft completed the journey. With an experimental turbocharged Rotax 912, this was the first serious attempt at Everest. The machine worked perfectly in testing in the USA and Czech Republic, but suffered from terminal engine problems in Nepal, indeed, with no possible emergency landing places Jan was lucky to get to Lukla before it expired. In deteriorating weather but with a film crew to satisfy, the focus of the expedition changed to an attempt to get their other Rotax 532 equipped trike over Amadablam 6855m (22493 ft) and in this they succeeded handsomely, reaching 7150m (23460 ft). So near and yet so far; 80 Minutes over the Himalayas. Used the ultralight to teach 18 canada geese their migratory route on a seven day flight from Purple Hill, Toronto to Airlie Virginia. The flight was well documented on video, led to the creation of Operation migration and provided the basis for the 1996 Oscar-nominated feature film Fly Away Home. 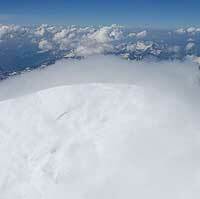 They planned to fly from Talkeetna to the base camp of 20,320-foot Mt. McKinley in Alaska. Jacober on a whim decided to fly over the summit of "Denali" the great one in his Antares MA-31 trike fitted with a UFO wing. 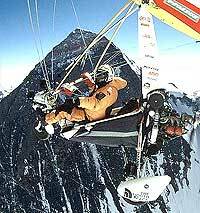 By flying over the peaks summit at an altitude of 20.500 feet equipped with oxygen Jacober went on record as the first to fly over the mountain in an Ultralight. 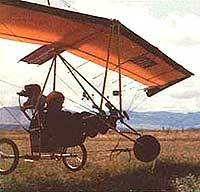 With the opening up of the Eastern Block, microlight pilots could fly untested territory. Luc Lefevre decided to use his three weeks holiday to fly a flexwing from the Atlantic to the Black Sea and then onto Russia itself. Aircraft: 2 x Antares plus 2 x Unknown trikes. A group of seven Russians in four flexwings took off from Uelen, Chukotka, crossed the Bering Strait and landed at Wales, Alaska crossing the symbolic divide between the old east and west which had never been flown before in a microlight. Aircraft: Cosmos Chronos / Rotax 582, Mainair Flash 1 / Rotax 462. 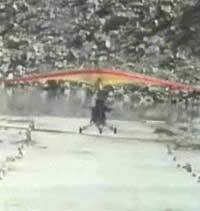 Expedition to film four hang-gliders for the BBC TV series Classic Adventure in Kenya. Ben was flying the aerotow tug while Richard was with camera man Sid Perou to film Judy Leden, Mark Dale, Tim Hudson and Louise Anderton attempt to fly 650 Km (350 Nm) down the Great Rift valley from Lake Turkana to Lake Magadi. 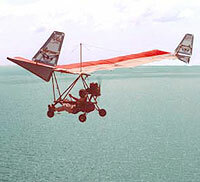 Although the gliders only managed to fly about half the entire distance contiguously, it was a demonstration of the possibilities of aerotowing in an expedition environment. 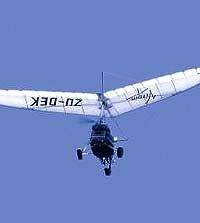 The microlights flew a total round-trip distance from Nairobi of about 1500 Km (800 Nm). 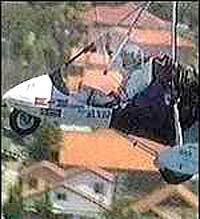 Ex-RAF helicopter pilot Trevor is a tetraplegic, paralysed from the neck down in a skiing accident, so there was a special risk for him on this solo flight as he would not have been able to escape from his specially-adapted aircraft in the event of an engine failure over the sea. The story of the flight is included in his 1997 autobiography Walking on Air: The Inspirational Story of a True British Hero. Took off at midnight for an attempt at the World distance record over the sea to Egypt. Half way through the flight, a favourable wind encouraged him to change his plan and head for Cairo rather than Alexandria, but once over land he encountered a headwind and very short of fuel made an unannounced landing at an Egyptian airforce base some 100 Km short of Cairo. Later that evening he was bundled into a truck along with his machine and unceremoniously deported to Libya who claimed he'd infringed their airspace. The Egyptians denied he had ever been there so he could never claim a formal distance record of about 1640 Km (886 Nm). After two weeks he was released from prizon in Benghazi, the aircraft was eventually returned several years later. 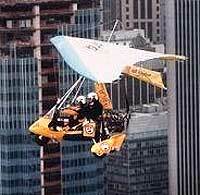 Aircraft: Special construction trike, Synairgie wing / Rotax 912. With a 350 litre fuel tank, the trike had a claimed 40 hours endurance. The 2700 Km (1457 Nm) flight across the atlantic from Senegal to the island of Fernando de Noronha (c. 370 Km from Brasil) took 27 hours of which five through the intertropical convergence zone was in extremely difficult and turbulent conditions. La route de Mermoz en ULM. 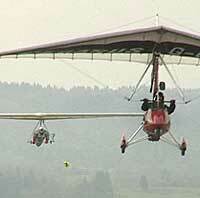 Two brothers set about rescuing a third from Eastern Germany by microlight. The two already in western Europe had each escaped over the Berlin wall in 1974 and 1981. Two microlights were involved: the brothers knew that if one aircraft failed on landing, the other would be able to get all three of them back. Aircraft: UPM Omega Raven / Sauer 4 stroke. First trike to Australia, took 300 flying hours. The only technical problem was poor fuel quality in Burma. Aircraft: Windmaster Raven X / Limbach. The flight took him over England, Scotland, the Faroe Islands to a nearly terminal stop at Reykjavik where it took nearly a year to negotiate the permission to continue. He eventually flew on over Greenland and Northern Canada to USA often in very extreme conditions with little chance of rescue. The full story can be found at www.microlighting.com. Departure was earlier than planned after news came of Eppo Numan's (qv) arrival in the Faroe Islands. While both were in Iceland he obtained permission to depart Reykjavik much earlier than Eppo and set off west. After seven hours Greenland came into sight but after a further five and a half hours of flying up and down the coast in a fog he was unable to locate the only available airfield at Kulusuk and was forced to land on very rocky ground which destroyed the aircraft. Long flight across the mediterranean intended as a build-up to an attempt to make the first transatlantic flight by microlight to celebrate the 200th anniversary of the French Revolution. French organized 'Raid' of some 3500 Km across Algeria down to Tamanrasset and back. Notable for a group of pilots who all got lost in the desert for several days after the emergency beacons they were supplied with were all set to the wrong frequency. First (and perhaps only?) takeoff and landing by a microlight on an operational aircraft carrier. In the Atlantic ocean, some one hundred miles off Florida, USA. Disatisfied with just being the 'support man' for Brian Milton's flight to Australia (qv), once in Australia Neil succesfully completed a major expedition on his own account by flying around the whole coast of Australia in 189 days. He covered 21700 Km (11700 Nm) in 44 flying days but the total time was somewhat longer due to a number of engine failures and several other incidents including being blown upside-down in Kithira (Greece), a forced landing in a sand storm in Saudi Arabia and a ditching in the Arabian Gulf. Brian wrote about the flight in The Dalgety Flier. The aircraft is now in the Powerhouse museum in Sydney. Unsupported three month flight and adventure from the Cameroon rain forest to the Atlantic, via the Sahara and Timbuctou. 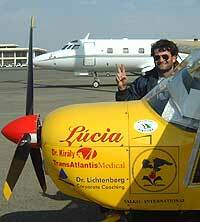 Author Christina wrote a book Travels with Pegasus - A Microlight Journey Across West Africa about the journey. Believed to be the first sea crossing to Ireland, achieved as a part of a much longer flight around the British Isles. Their first attempt the previous year in two Baroudeurs failed when Hulot crashed and de Chevigny gave up 600 Km (320 Nm) further north in bad weather. This time, they set off from Resolute bay, Canada in enclosed aircraft and with a 6.5 Kg GPS which only worked for 4 hours each day due to the limited number of satellites then available. In three flights over a week they flew the 1020 Km (550 Nm) to their last refuelling stop at Ward Hunt Island. The Avid was so heavily loaded with 320 litres of fuel, de Chevigny bumped along the ice for 3 Km before lifting off for the pole. Hulot thought it not necessary to carry quite so much, but ran out 94 Km (51 Nm) short of target and had to land. "I had 30 litres in my tank, and I had to give half to Hulot" de Chevigny said, "So we took our cooking pot and filled it with half a litre and walked very very carefully 200m to Hulot's plane. We did it 30 times." A few hours later de Chevigny pressed the 'save' button on the GPS when it read 89° 59' 945"N; about 100 metres from the pole, they each had about 10 minutes of fuel remaining. Total distance was 2329 Km (1258 Nm) in 27 hours spread over 6 flights. The aircraft were retrieved from the pole in a Twin Otter and a DC3; on the flight back Hulot was patched through to his girlfriend Valerie in Paris on HF radio and he asked her there and then to marry him. She accepted. There is an account of the flight in Christopher Pala's book The oddest place on Earth. TV news, Video: North to Nowhere. 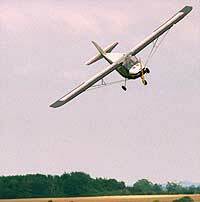 Aircraft: 2 x Southdown Raven / Robin 2 cyl and 3 cyl. The flight took just 22 days and attracted considerable press attention in India. Much later, he wrote about the flight in An Angel In The Cockpit. 15 months travelling to get to Sydney on this epic first flight over the 'classic' route to Australia via France, Germany, Austria, Czechoslovakia, Yugoslavia, Greece, Turkey, Syria, Jordan, Saudi Arabia, Dubai, Abu Dhabi, Oman, Pakistan, India, Bangaladesh, Burma, Thailand, Malaysia, Singapore and Indonesia. Broke the undercarriage in Yugoslavia, welded it and replaced with new in India while waiting for the engine to return from overhaul, and then a forced landing in Burma. No back up except the phone back to UK, had to do all clearances, maintenance, everything herself. 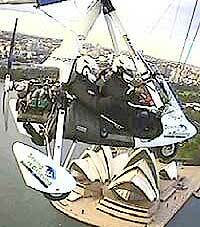 When asked if she ever feared that she would not get to Sydney, Eve replied: "No, not really. After all, there was no reason to fly unsafely, and if you fly safely you get there in the end, don't you?" September 1985, Over the Alps. First flight from Switzerland to Italy over the Alps. 28 August l985 - 17 June l986, London - Capetown. Aircraft: Mainair Gemini Flash 1 / Rotax 447. Distance of 16000 Km (8600 Nm) from London, through France, Italy, Greece, Egypt, Sudan, Uganda, Kenya, Tanzania, Zambia, Zimbabwe, Botswana to Cape Town, South Africa. Supported by his girlfriend Nicky in a truck, the journey included the first crossing the Alps from France to Italy, the longest ever sea crossing from Crete to Alexandria, the first crossing of the Sahara desert by microlight, safe overflight of the civil wars in Southern Sudan and Uganda and the first attempt to fly over Mount Kilamanjaro (reaching 5480m, 18100 ft). August l985, Annaba, Algeria, to Monaco. 830 Km (448 Nm) across the Mediterranean with air-to-air refueling 5 hours into the flight from a helicopter with a long spray-boom trailing a hose which transferred 80 litres in about 8 minutes. 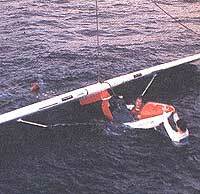 The aircraft was ditched into the sea just off Monaco. 3 July 1985, Lands End to John O' Groats in a day. Carrying 140 litres of fuel, it was nearly flown without stopping but landed short of fuel 60 Km from target after 952 Km (514 Nm) in 10 hours 51 minutes, but still beyond the existing World record non-stop flight. Continued to destination the same day. 26 September 1984 - 26 March 1987, Round the World. Aircraft: Aviasud Sirocco / Rotax 377. This extraordinary 562 hour flight across 33 countries 'the wrong way' was done in several stages, France to Dakar, Brasil to West coast USA, Thailand and Malaysia, Bangladesh and India, and finally from Oman back to France. The aircraft went by air or sea freight in between. He wrote an account of the journey in his book La Folle Equipee, the aircraft is in the Musee Delta Athis Paray Aviation south of Paris. Demonstrated that microlights could be excellent expedition support vehicles in remote areas on this journey from the Vatnakojull glacier, over Dettifos, Europe's largest waterfall and down the Jokulsa-a-Fjollum river to the sea. At various times they flew with skis, floats and carried the Kayaks on special racks. A TV film and book were made of the journey. Simon Baker's website. 4 August 1984, Escape from Czechoslovakia. Flew from Czechoslovakia to become the first refugee to successfully fly a homebuilt aircraft over the Iron Curtain to freedom. The aircraft is in a West Berlin museum where you'll notice the nick in one of the prop blades. 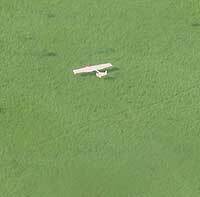 As he took off, he heard a rock hit one of the blades. Had he made the prop from wood, he says it probably would have broken. Instead, it held together as he flew above the trees toward a border radar station. Directly above it, he pushed the engine to full power and climbed inside the radar's cone-shaped blind-spot to a couple of thousand feet, then glided swiftly across the Danube to safety in Austrian airspace. "... I wanted to leave at 3 a.m. because that is when people were least active. So I ended up flying over Vienna for two hours like a tourist then went looking for the international airport. I circled the tower twice but there was nobody there! Ha ha! It was still dark then - this is the fun part - I saw a 747 being towed along a taxiway. There was a little bit of light there, so I landed beneath the wing of this Boeing. Enough room for two trikes! Besides, mine didn't have a pole or wires on top but was strut-braced, something from having to keep a low profile when flying below electric lines. Anyway, a mechanic came running out, yelling. I raised my hands with an expired Czech passport and asked for political asylum. Then they were really nice to me .... ". After being shuttled around Austria for six weeks hiding from the Czechoslovak secret police, he was flown to California to begin a new life. Since he had started with a trike that he built secretly in Prague and had taught himself to fly, he began to build another in the U.S. by first making a propeller. He sold the prop at an airshow for enough profit to build two. Those provided enough money to make four and so on. Now almost 3000 Ivoprops are built each year. The Ivoprop story. Served as ice spotter to the steel sailing yacht Vagabond 2 in the Canadian Arctic which managed to get very close to the magnetic North Pole. The story is probably included in the 1981 book Vagabond et les adventures Polaire d'aujourd'hui by Janusz Kurbiel and Jean-Michel Barrault. For nearly all pilots this was their first crossing of the channel. 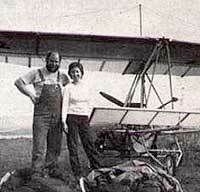 The event was a turning point in European microlighting, the occasion when the sport came of age and the media was forced to take it seriously, if only because they treated it like "those magnificent men in their flying machines" but to their eternal disappointment no one dropped into the Channel. 1982, Length of New Zealand. Flew some 3200 Km (1727 Nm) in 41 Hr 25 Min flight time from Cape Reinga down to Bluff at an average speed of 79 km/h, providing many New Zealanders with their first ever glimpse of a microlight. One Northland Maori was quoted as saying: "I had to come along and see this when my kid said there's some pedal planes up there". They were joined for the final stage of the flight by Murray Hagan in a Pterodactyl Ascender and Graeme Henderson in a Shark Trike. This constituted the biggest assembly of microlights to gather in New Zealand thus far. 14 - 21 October 1982, California to Mexico and back. 8 April 1980, Flight down the Hawaiian islands chain. 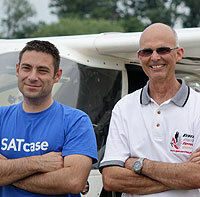 Pilots: Tim Friesen and Wesley Friesen (USA). Aircraft: 2 x Wrong Brothers Aviation "Right Flyers" Cuyuna 340 Twin Cylinder Engines. The flight was 228 Km (123 Nm) over water in two "Right Flyers" which they manufactured, and were one of the first in the industry to be fitted with two cylinder two stroke engines. Tim relates: Departing from Upolu Point Airport on the Northwest coast of the Big Island of Hawaii (on an extremely windy 25-30 knot day), we set off to travel 139 miles over open ocean towards our destination of Olomana Golf course (a somewhat makeshift runway) on the island of Oahu. With a very strong tail wind the flight took 3 hours and 10 minutes, and included a wild roller coaster ride while flying past the island of Maui as the high winds tossed our 160 lb (dry weight) ultralights through vertical drops and ascents 200-300 ft at a time. This lasted about 10 minutes and scared the hell out of us. After the Maui ordeal, my engine shut off over water as I jokingly crossed my legs to signal the chase plane I had to go to the bathroom and inadvertently hit the kill switch. I very quickly hit it back on and resumed flying (we didn't have electric or pull starters back then - if the engine completely shut off, that was it). The Honolulu Advertiser Newspaper sponsored and officially witnessed our historic flight. 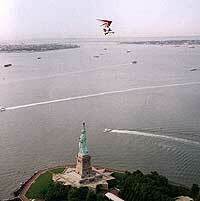 Good Morning America flew us (and 1 ultralight) to New York after the flight to be interviewed live with Joan London. First weightshift microlights across the channel. 9 July 1979 - 6 August 1979, Coast to Coast USA. 4 July 1979 - August 1979, Coast to Coast USA. 9 May 1978, Channel crossing. He took 1 h 15 min to fly from Walmer Castle near Deal in Kent to Les Baraques in northern France near the spot from where Bleriot had started his first ever crossing, 69 years earlier. Credit for some information shown here goes to the BMAA's History of Microlighting and Microlight Flying magazine, otherwise the sources are shown.